Chet Baker Steals the Butter! You know that good feeling you get when you find something that WORKS? It may not be expensive or particularly beautiful, but it just WORKS. in big red letters in the margin. I happened upon a column called "My Way: The Water Bowl" in the Jan/Feb 2015 issue. It was by BWD subscriber Lorna McKerness. 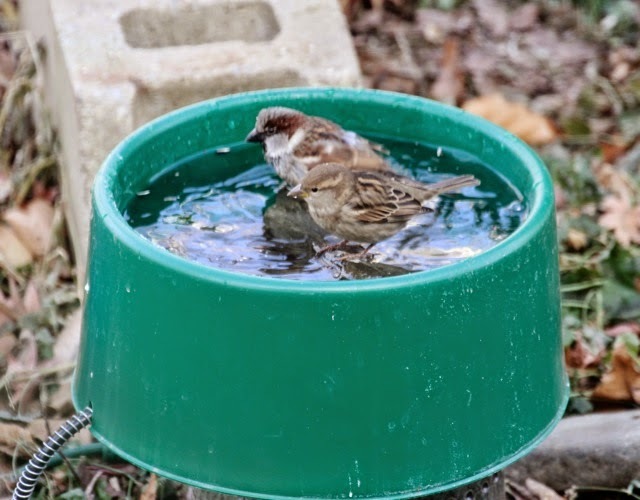 A resident of Alberta, Canada, she's faced with below-freezing temperatures for much of the year, and she'd hit upon the idea of using a heated dog water bowl as a year-round bird bath. She had tried any number of commercial products, but they were often very expensive and lasted little more than a year in those punishing environs. 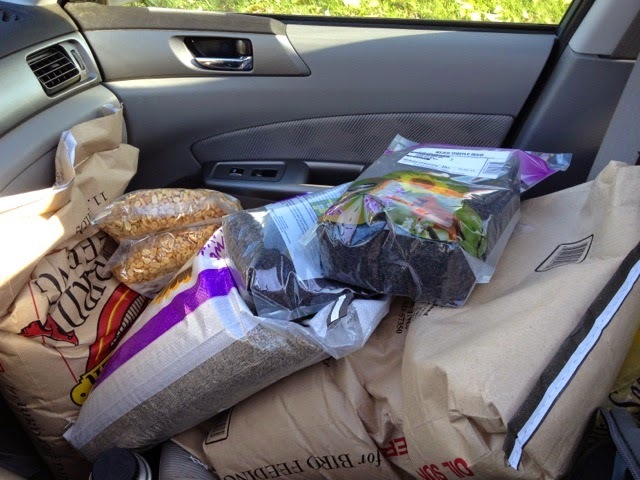 In the article, she said she was at the feed store buying two more, and the woman behind her in line added a heated dog water bowl to her order, too. That made Lorna happy. and I remembered Ms. McKerness' piece, and lo and behold, down on the lowest shelf around the corner I found my next purchase. It comes in green or swimming-pool blue. Neither of which would be colors I'd choose, but hey. The point in the dead of winter is not necessarily beauty. 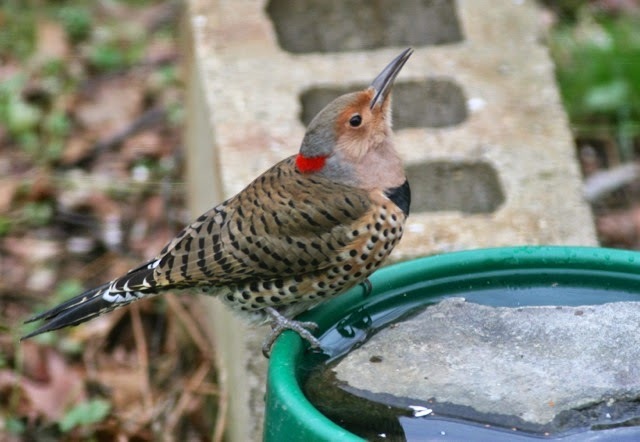 It's providing open water for thirsty birds. All I'd have to do is plug it in and run an outdoor extension cord to a GFCI-equipped outdoor outlet. I could do that. I'd put it right where the (frost-vulnerable) Magnificent Bird Spa reigns supreme in warmer temperatures. The price was right: $22.99. I grabbed one. 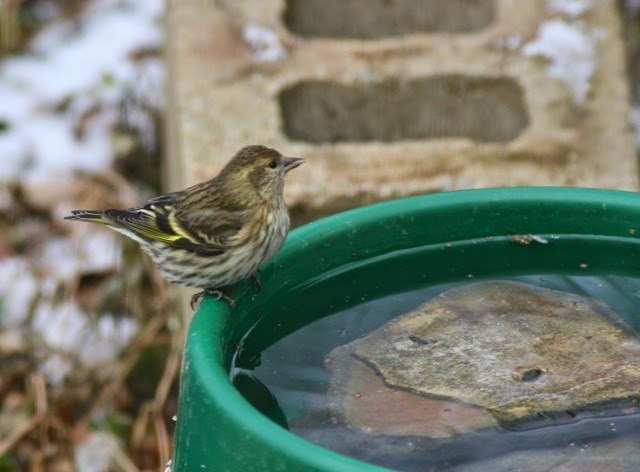 and a pretty yellow-trimmed pine siskin was the first taker on the new bowl! 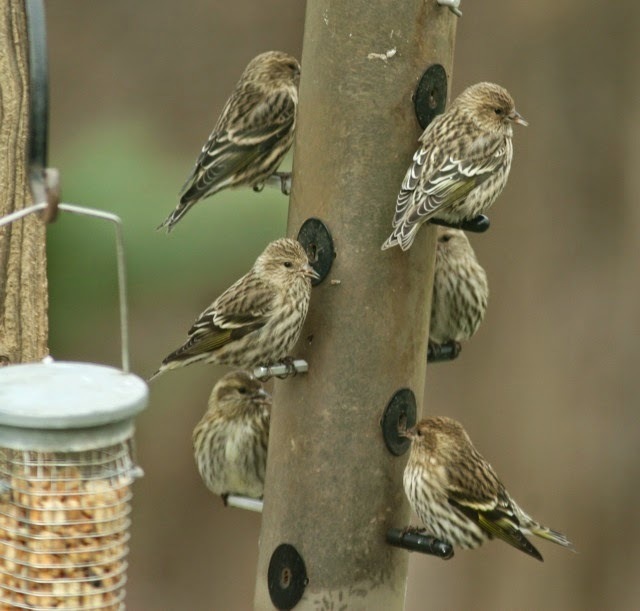 Pine siskins are big drinkers. As you can see, I've stacked three big flat rocks in the bowl to make a flat, level surface for a bird to stand on should it wish to bathe. I'd had my doubts about the slippery plastic as a friendly perching surface, but the siskin didn't hesitate. He was thirsty. Since installing it November 3, 2014, I've had the best time documenting the heated dog dish's inaugural winter. Herewith follows a gallery of ugly photos of beautiful birds slaking their thirst. A pair of bathing house sparrows. Here you can see the coil-protected cord. 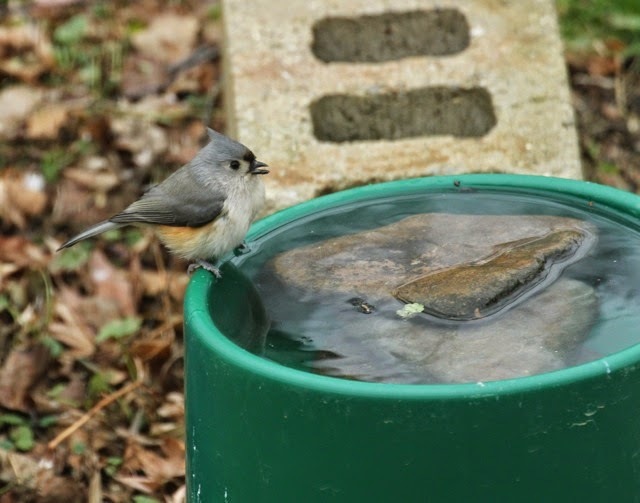 A tufted titmouse drinks. We're having a banner year for TUTI's. A female white-breasted nuthatch, with her shadow-grey cap, appreciates the flat rock for perching. She has very long toenails and doesn't like the slippery plastic. 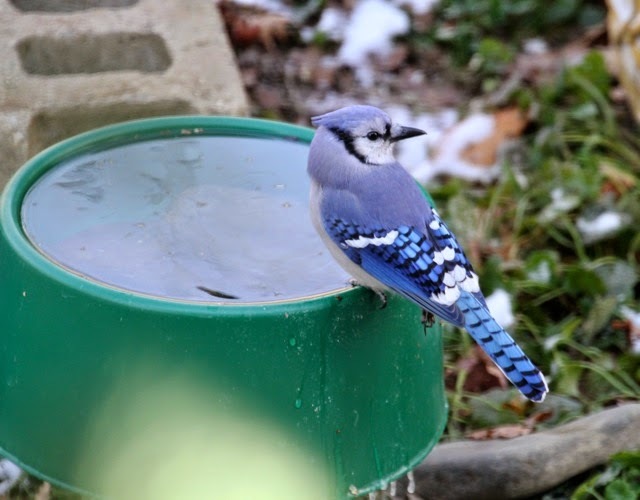 One of the very first visitors to the new bowl was Peg, a blue jay of whom I've grown very fond. Peg has but one usable leg (you can see her useless right leg dangling). I'll tell her story in another post dedicated to her. Seeing her getting fresh water in freezing temperatures makes me feel good. 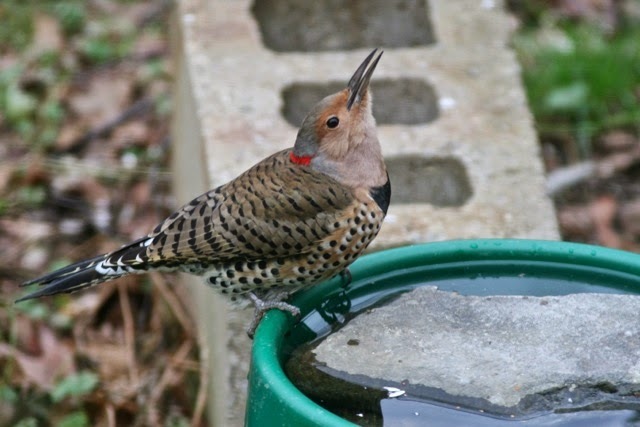 I was on the phone with Bill, who was calling from Uganda, when a yellow-shafted flicker hopped up to the bowl! We hurriedly ended the conversation so I could document this spectacular visitor. Oh how I love a flicker. Probably my favorite bird to paint of all. This is a girl. No black moustache. Please appreciate those googly eyes all over her breast and belly. Swoon. As you might have surmised, I am totally in love with my ugly green heated dog bowl, and I dream of manufacturing something similar, but more beautiful--rock-colored, rock-shaped. I'll say this--with its simple round reservoir and smooth surfaces, it's a snap to clean and refill--the work of a minute. I just bring a bucket of hot water out, give it a little scrub, then rinse it and the rocks and refill. Maybe it doesn't need beautification. The birds do that. Maybe I need to stick to writing about them and painting them. I am not the only one who likes watching the birds and chipmunks use the heated dish. If I've given you something you can use in this post, something that's not necessarily beautiful, but that WORKS, that makes me happy. But what would make me happier is your subscribing to Bird Watcher's Digest, where I've found Lorna's article and so many more useful, informative and awesome articles over the 28 years I've been associated with it. Bill's mom and dad started it in their Marietta living room in 1978. They licked stamps and stuck them to the first issue, putting them in mailboxes all around Marietta, until the Postal Service told them you can't do that. How far they've come...with a kickin' digital edition as well as print; with wildly successful Reader Rendezvous' (I'm hosting my second this coming June! ); with regional events like The Midwest Birding Symposium and the upcoming American Birding Expo '15 in Columbus. I saw one of the very first issues in a newsstand called Nini's Corner in Harvard Square when I was a student. I remember it had a cover painting by Roger Tory Peterson, of sooty terns. And I remember thinking, "Gosh. They don't need little old me to paint a cover. They have Peterson! As a painter and columnist!" That was more than two dozen cover paintings ago. Just counted up--September/October's passenger pigeon was Zick cover # 25. Since my first one in 1986, I've painted more covers for Bird Watcher's Digest than any other artist. I'm proud of that. I've long since lost count of the articles I've written, the illustrations done. They are legion. 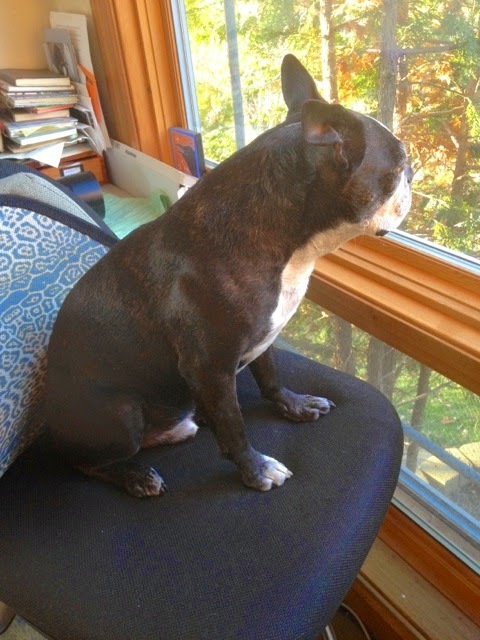 I write a column, "True Nature," for every issue. So here's where I invite you to subscribe to one of the very last family-owned and operated magazines on Planet Earth. Oprah couldn't keep her magazine afloat in the 21st century, and it was a dang good magazine. Somehow the Thompson family has persevered, and continues to hang on, producing the very first, and what I believe is the best, birdwatching magazine in America. $19.99 gives you a year of enlightenment and entertainment. Maybe it'll be the best thing you've ever bought. One in huge black tub from Tractor Supply (for deer) & 2nd in small plastic pond w/ rocks to aide errant chipmunks! Thank you for a great idea. Maybe not this winter, but I have the ground fault interrupter already wired to run the garden pond. I could do this and providing water is such a challenge here. We have also seen an amazing number of tufted titmice. Usually we have maybe two to four. This year a whole flock. @Raymond: No. I would not. Because this is not Florida, and nothing here in winter is green. Especially not that color of green. Ucch. It's only marginally better than swimming-pool blue, which was my other choice. What I would pick, or manufacture, if I were so inclined and had the slightest talent for it, would be a lovely mushroom color. Brownish gray. The natural equivalent of almond in kitchen appliances. Julie, could you use the sticky backed grit covered stair treads that go on outdoor steps on the edge of the bowl? Just thought of this while reading your great post. which reminds me I need to add some food to my feeders! We have that exact same bowl in our back yard! Everybody LOVES it! 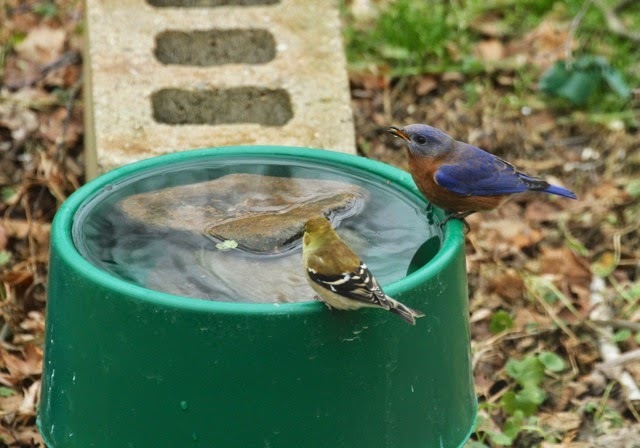 Great idea - fresh water in winter helps so many birds and critters. We use animal feed tubs, bigger, and not heated, since freezes are rare in S Texas. There is a paint you could try, Fusion, comes in aerosol and in many colors, made especially for painting plastic. I bet you could create a camo effect. BWD is the best deal around! I've been in from the beginning and the magazine and its writers have contributed to my life immeasurably, bimonthly. Thanks to BWD and congrats, Julie on your 25th cover!! Xom. I like your thought that perhaps just leave the green color and focus on the birds that brighten it up. I like the color green because it’s the color of so much flora. And I subscribe to Birdwatcher’s Digest AND the Watching Backyard Birds magazine. Love them both! Thanks for staying a family business !! And a heated bird bath is a wonderful thing. I have every issue of BirdWatcher's Digest from September 1978 on. The first ten years' worth are even in the green BWD binders! Somehow I became less organized after that. Not much has given me greater pleasure over the years than seeing my latest issue in the mailbox. Your blog readers who love you would love the magazine! 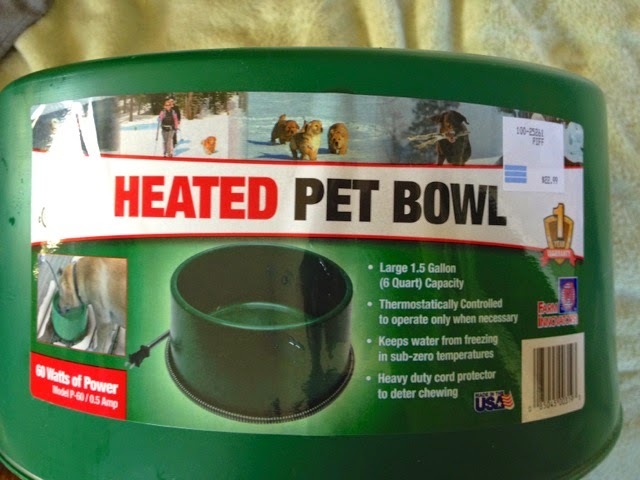 That heated dog bowl is on my shopping list for tomorrow. Thank you!! Besides the interesting information about birds in winter and what we can do for them, the best story here is about the family-run business that reaches across generations and continues to bring the members together with dedication and passion. Sensational post. I loved seeing the birds and I am going to look for one of those heated bowls for my birdies too. I love blue jays, and this summer we had an amazing encounter with one. I blogged about it here: http://threepsandq.wordpress.com/2014/08/08/pheathers-the-bird-whisperer-or-small-miracles/. God bless. I admire that your paintings grace so many covers of BWD and that it is a family run magazine. 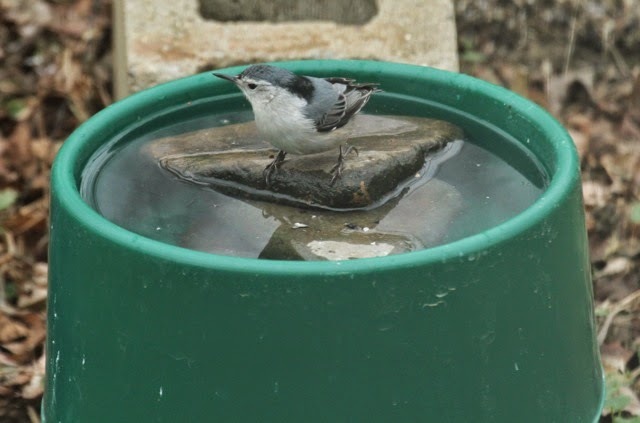 Your heated water bowl is a super idea for helping birds in cold weather. What an excellent idea! I've been thinking on how to do this for a price I can manage right now! Great idea! 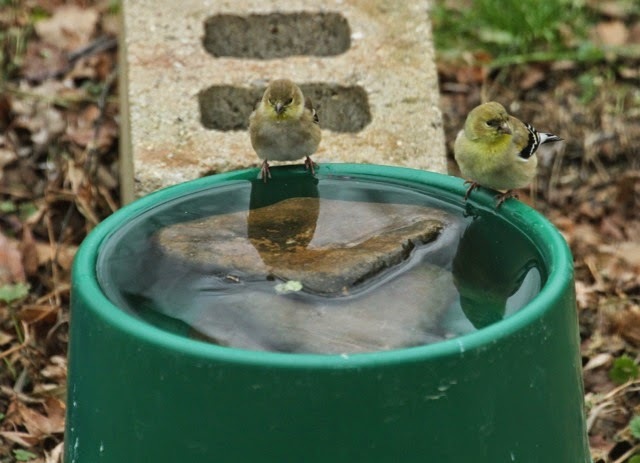 Our pond pump broke recently & this would be an excellent solution for thirsty birds. Every other day I bring a bucket of hot water out of the house and scrub it out with my hands, rinse the rocks and refill. High-traffic. There's almost always a bird sitting on it. And the mourning doves like to sit on the rock and crap into the water. Duh. I just discovered this blog and comments yesterday. I was indulging myself in a little vanity by googling my name and eventually arrived here. You see, I am the one who wrote the BWD article Julie referenced. 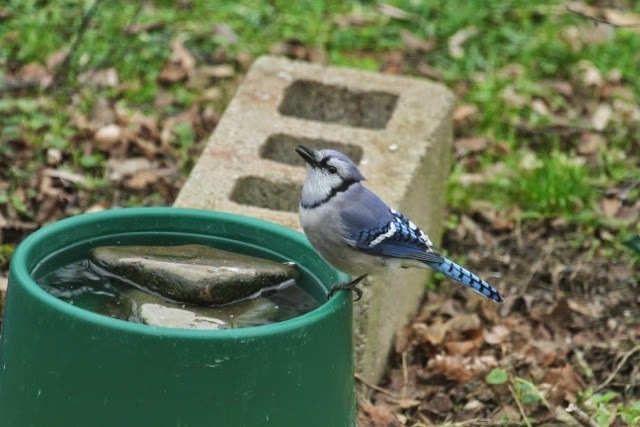 When I came up with the idea of putting a large flat rock in a heated dog water dish and filling it, I was hoping that the birds might like it. They did! And then when the other customer overhead my explanation at the UFA store and purchased one for herself, I was thrilled. But it wasn’t until years later that I decided to write the article about it. I was glad that BWD published it, but I wondered whether other people would decide to try my idea. Now, I know. The knowledge that so many birds, including disabled ones, in so many different places are having a little easier life due to my idea is, by far, the best Christmas gift that I have ever received. Thank you all. And that, Ms. @Lorna McKerness,is why we give attribution where attribution is due. I'm so thrilled to hear from you, thrilled that you are happy that I've passed your heated dog dish like a friendly torch to so many people. This is one of my "viral" posts, one that people keep coming back to again and again (along with Zick Dough, Improved). And that I owe to Carrie Griffis, who appeared in BWD's pages hand-feeding a male pileated woodpecker with the stuff! You're in exalted company as an innovater in backyard bird care. Thank you!! !